Birds vs. Blades? Offshore Wind Power and the Race to Protect Seabirds was released on November 1. School Library Journal said, “Tightly written text and rich photography make this a must-read for those interested in environmental science and clean energy.” I asked author Rebecca E. Hirsch to share how her new nonfiction book for young people came to be. The idea to write Birds vs. Blades? came during a 2013 phone call with seabird biologist Iain Stenhouse. Iain works at the Biodiversity Research Institute, and I was interviewing him for a magazine story I was writing about a bird that lives at sea. Toward the end of our conversation, Iain told me about a research project he was involved in. Scientists were using high tech tags to track mid-Atlantic seabirds and learn more about their movements. The work was urgent, because the federal government and developers wanted to build offshore wind farms along the mid-Atlantic coast. (An offshore wind farm is a cluster of wind turbines, each as tall as a 30-story building.) To protect seabirds, developers would need to build wind farms away from migration corridors and key bird habitat. But no one know where exactly the birds traveled and lived in that part of the ocean. To solve the mystery—and keep seabirds safe—scientists were capturing birds from a small boat on the winter ocean at night and tracking the birds using surgically implanted satellite tags. I was intrigued. I thought the project had many elements that would make an interesting book: at-risk animals that survived in an extreme environment; a mystery that urgently needed to be solved; and the use of cutting edge methods to try to solve the mystery. There was also an important environmental issue: how can we keep seabirds safe while developing the ocean for clean energy? I began to research the story. Very little had been written about the project, which meant I would have to learn almost everything through interviews with the scientists who were carrying out the work. Each of the men and women I interviewed was passionate about wildlife preservation and generous with their time. One biologist was, at the time I emailed him, tagging bats in Maine’s Acadia National Park, far out of cell phone range. In order to talk with me, he left the park on his day off, drove to a nearby town, and talked to me by phone from a coffee shop. I was invited to tag along on some nighttime missions to capture seabirds. From my interviews, I had heard stories of being on a small boat in choppy water, icy rain, blinding snow, and dangerous fog. I gulped and said yes. Rebecca Hirsch (right) ready for her scientific adventure! 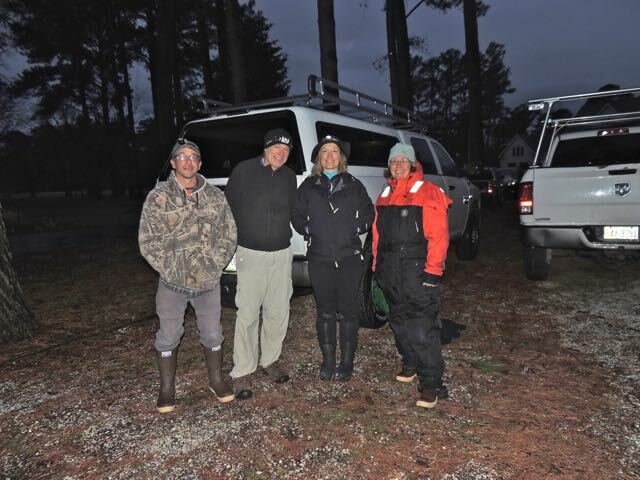 On a gray March day, I drove from my home in Pennsylvania to a house in Cape Charles, Virginia, which the crew was using as a base for some capture missions on the Chesapeake Bay. As the sun went down, I dressed myself in layers of clothing to stay warm, then wrestled my way into a fishy-smelling survival suit. The suit would keep me warm, afloat, and visible in case I fell overboard. I nervously joked with the boat crew about that and tried not to think about it. That night the weather was rainy and foggy. The crew hoped the fog would lift—in it they couldn’t see any birds—but eventually they gave up without capturing anything. So I stayed on for another day. The next night was clear and calm, and the crew’s luck improved. I found that capturing birds was thrilling work to witness. I gripped the rail when we raced across the water in pursuit of a low flying bird. I watched in awe as the team worked in harmony—scooping birds out of the water, weighing and measuring them, and placing each one securely in a plastic tub for transport to shore. 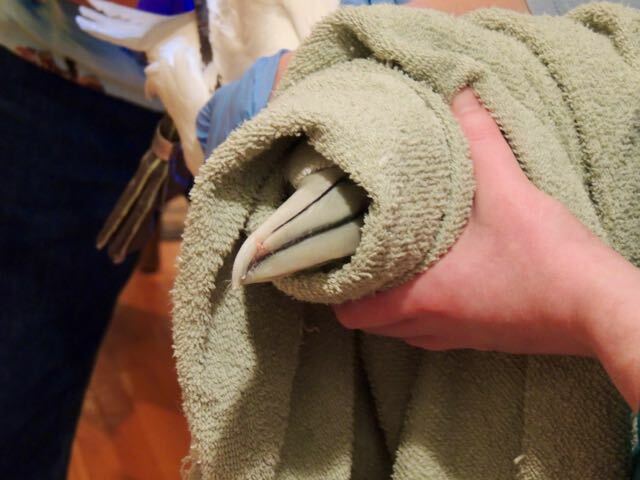 Later I watched as a team of veterinarians examined each bird, wrapping the head in a towel to ease the bird’s stress. 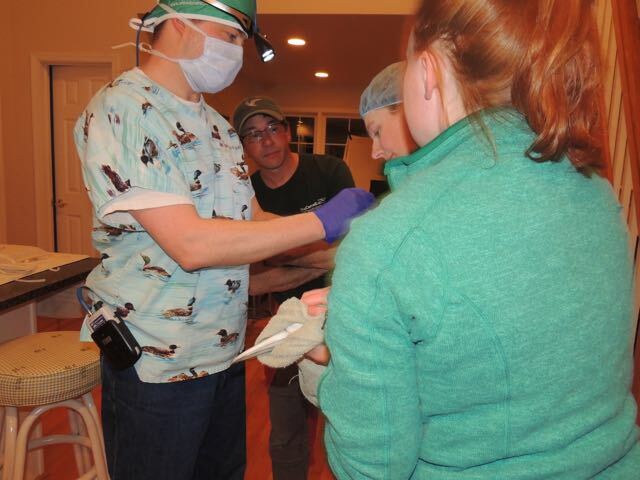 As veterinarian Scott Ford performed surgery and implanted a tag, he explained each step and stressed how important it is to protect the bird’s feathers, which are critical to survival. Careful handling could make the difference between life and death once the bird was released back into the water. A whole team helps with tagging a bird. I’m very proud of the book that resulted. My hope is that through Birds vs. Blades? Offshore Wind Power and the Race to Protect Seabirds, children will be exposed to the real-world environmental challenge of keeping the ocean safe for birds while developing offshore wind power. I hope you enjoy it too! NOTE: For more from Rebecca, check out this blog post.